My family might be making a move sometime in the next few months. As a result, I’ve been thinking a lot about the costs associated with moving. This time, for the first time ever, we’re thinking of hiring professional movers. It’s true that we have used companies like ABF U-Pack to move our stuff, but we had to load it on the truck ourselves. This time (if it actually happens), we’ll be moving due to work, and we have a little more money. That means that we can hire people to load the truck as well as drive it. Guaranteed price: Instead of agreeing to a non-binding price estimate, get a guaranteed price estimate — and get it in writing. The most reputable companies will send someone out to look at your situation and create an estimate based on what you have. Choose an “off” day to move: If possible, move on an off-peak day. You can get cheaper airfare when you fly on days with less demand, and you can get a cheaper moving price if you follow a similar strategy. Weekends, and the days at the beginning and end of the month, are the busiest and most expensive. Clean house: Rather than take everything with you, get rid of items that you don’t consider necessary, or that you aren’t particularly fond of. This is a great time to get rid of things you just think are “iffy,” as well as to get rid of the outright trash. Items in good condition can be sold or donated for a tax deduction. Advance booking: When you book your movers in advance, you can save on your moving rate. In many cases, prices are based on demand. If you lock up your movers ahead of time, you can do it when the schedule is fairly open. Once the schedule starts filling up, the prices increase. Pack yourself: While many professional movers will help you pack your boxes, it will cost extra. If you want to save, get the boxes ready on your own. Then the movers just need to come in and get them, and load them on the truck with your large pieces of furniture. FlatRate also points out that it’s a good idea to start packing ahead of time. You can ask your mover to recommend an amount of materials to buy, and then purchase them yourself. If you pack far enough in advance, you can ensure that you have all the materials you need. 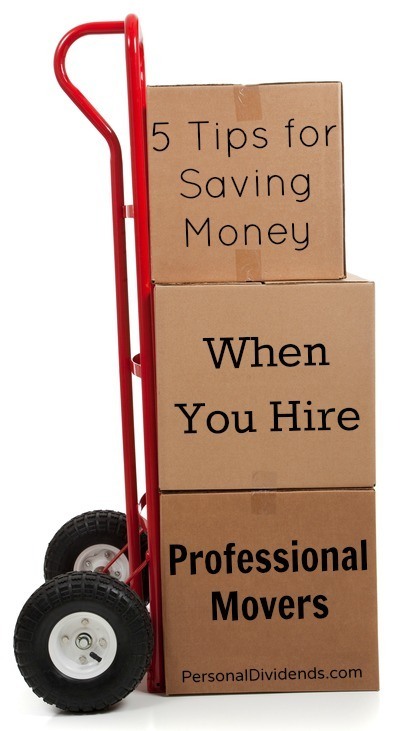 Finally, don’t forget that, if you meet certain requirements, your moving expenses are tax deductible. That means that you should save all of your receipts so that you can deduct the cost and recoup some of the expenses. The moving deduction is above the line, so you don’t have to itemize in order to take advantage of it. If you have questions, you should contact a knowledgeable tax professional to help you. Many professional movers disallow you to pack yourself – if you want items insured in transit, they have to pack.